German police close down, surround shopping mall after receiving warning of possible terror attack. German police on Saturday sealed off and closed a shopping mall in the western city of Essen after receiving notification from security services of a possible terrorist attack. 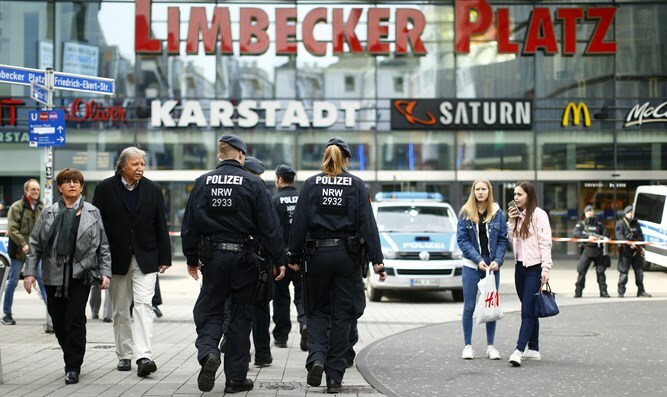 Speaking to a German broadcaster, a police spokesman said they were told terrorists were planning an attack on the Limbecker Platz shopping mall. "Yesterday, we received very serious indications from security sources that a possible attack was planned here for today and would be carried out. That is why we were forced to take these measures," the Essen police spokesman told Reuters Television. Armed vans and police officers surrounded the mall, which is one of the largest in Germany. Civilians were evacuated and the mall was closed. In connection to the Essen threat, police searched an apartment in nearby Oberhausen and questioned the owner. They also detained a man in an Oberhausen internet cafe for questioning. On Thursday, five people were killed in an axe attack in Dusseldorf, Germany. On February 23, German authorities foiled a terror attack and arrested a 26-year-old man. On February 9, German authorities arrested two Muslims who were planning to carry out a terror attack.